< Previous A snail, is a snail, is a snail…..Not. You know you were meant to be a biologist when you get excited to discover that snails from different parts of the world look different. Both Puerto Rican and Malaysian snails are the size of mammoths compared to snails found in Sydney backyards (hopefully this fact makes Sydney gardeners a little happier). However, the shell shapes of these slimy creatures is very different. The snails from Puerto Rico are quite flattened, with the center point of the spiral barely protruding at all (photo above). 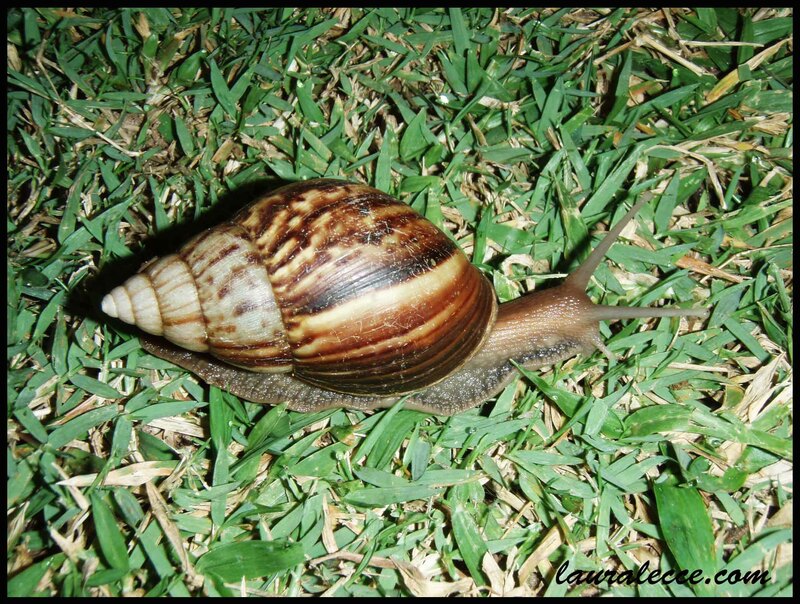 Malaysian snails have a very elongated shell with the spiral being very pointed (photo below). If you are unlucky enough to have lots of snails in your veggie patch in Sydney, you might one day be lucky enough to attract a blue tongue lizard to your yard. These stocky lizards will happily take care of your slimy infestation, which is reason enough for me to keep feeding the snails in the hope that a lizard one day comes to dinner.